You are invited to attend the opening reception for an exhibit which draws from interviews with immigration advocates. Some of those interviewed worked with the Chicago Metropolitan Sanctuary Alliance, now a part of CRLN. The exhibit is now open until the end of April on the second floor of the Damen Center. An online version of the exhibit will be available in early April. 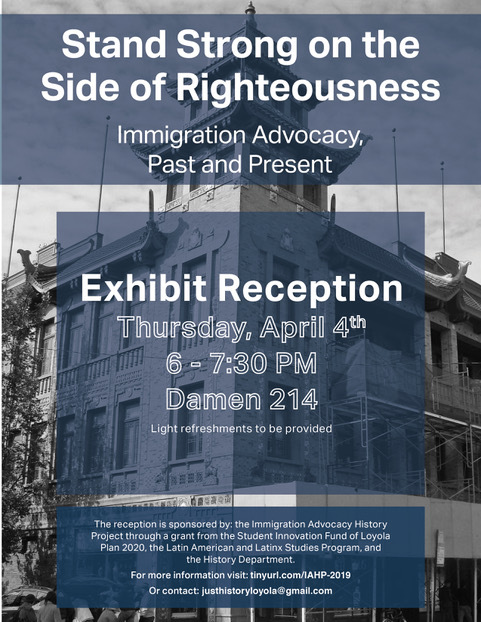 The Immigration Advocacy History Project is supported by a grant from the Student Innovation Fund of Loyola’s Plan 2020. The project is an effort of a Loyola graduate student group, Historians for a Just Society. Volunteers interviewed immigration advocates, whose stories will be preserved in the Loyola University Archives & Special Collections. The project also hosted a fall panel on immigrant identity and intersectionality.